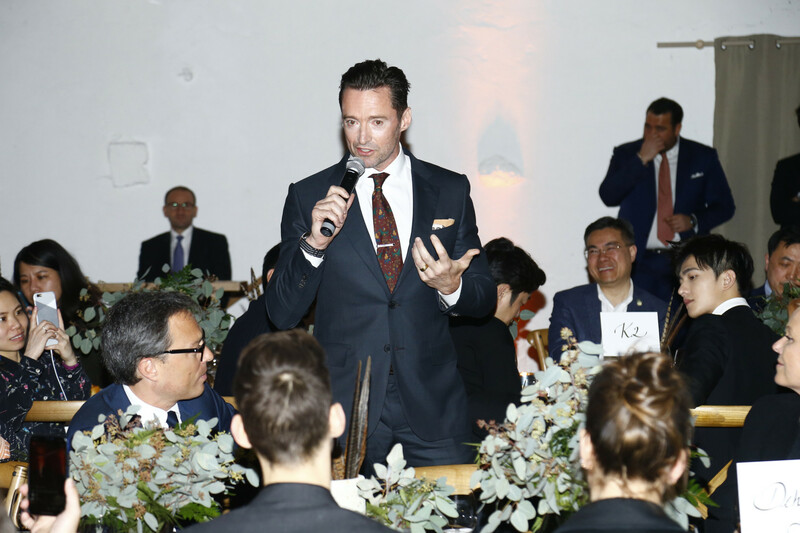 Montblanc celebrated the launch of its new 1858 collection with a gala dinner on Monday that paid tribute to the spirit of mountain exploration; Hugh Jackman notably made an appearance whilst wearing one of the company’s newest timepieces. Guests including brand ambassadors Hugh Jackman, Charlotte Casiraghi and Yang Yang as well as Pierre Niney, Lena Gercke, Aldo Comas and Macarena Gomez, David Gandy, influencers Danilo Carrera, Natalie Vértiz, Salvatore Esposito, Andrea Montovoli and mountaineer Kenton Cool. Guests were invited to capture their “exploration experience” in a digital GIF animation area. From there, the evening continued with a seated dinner inside the vaulted hall of the Chateau de Collex.